In the mornings, Clay normally gets Lo ready and takes her to daycare but I quickly realized that he was putting her in the same outfit different variation over and over. He likes Lo to be dressed in very simple non-cutesy outfits. I mean this is coming from a guy that would love for his wardrobe to consist of ten of one shirt and ten of one pair of pants…all black. My thought is that she’s a little girl and we should have fun with it. So, I would sit out outfits but Clay would overlook my outfit pick for the day and put her in an outfit of his choice. He loves the little groovy onsies (which I love too) and seems to pair them with the same turquoise pants every time. They are cute outfits but I decided that we should mix it up so about 3 weeks ago I started dressing Lola in the mornings. Well, one morning I’m in the bathroom getting ready and Clay stomps back and says “Are you trying to give me a heart attack?” I said “What do you mean?” He said “That outfit you put on her…I will not take her to daycare in that.” He continued on to say “First off, it’s lingerie (it was satin….not lingerie…but I agree…may be a little much for a baby) and “Second off, it’s ugly.” I just laughed. It actually wasn’t as cute as I wanted it to be on her. Anyway, this day Clay changed Lola into a onsie of course and I got out some cute little pants to pair with it. The pants had a little bit of lace at the bottom that you really couldn’t see at all. Clay says “Those pants have lace”. I just ignored him and went on. This is when I start thinking "OK...SERIOUSLY!!!!". It’s pretty funny how he is about Lo’s wardrobe….very opinionated to say the least. He told Lola yesterday that he was going to take her shopping this weekend and invest in some “groovy cool clothes”. I’ll be interested to see what they come home with….. 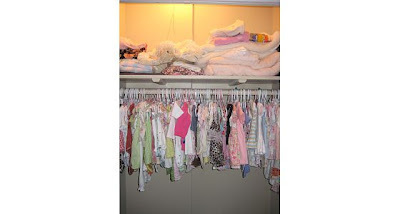 Attached is a pic of Lo’s fab closet. You wouldn’t believe the drawers and the stuff I have already stored away. It’s really insane. I also attached a picture of the outfit that almost gave Clay a heart attack (If interested, on ebay shortly)…ha,ha. This weekend I hope to get some stuff up on ebay. I’ll post the links on the blog next week so get your check books out!! !